Past projects where I was lead designer on the architectural team include multi-family, single family residential and commercial projects. Below are some examples. 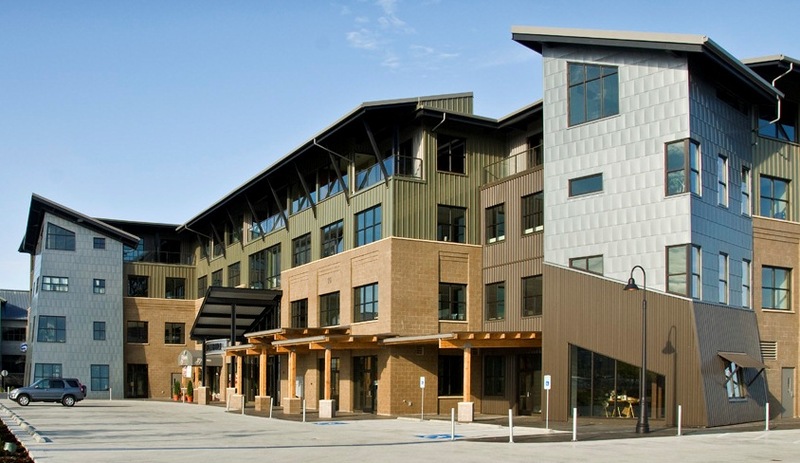 I was lead designer for the above project, which included four commercial buildings on Bellingham, Washington’s waterfront, the style of which is reflective of the history of a working commercial fishing port and craftsman-style references. The eco-friendly metal siding had a special coating to avoid contamination to the sensitive salt water location. The entire project is located over an underground parking garage. Below is an interior shot of the building lobby, a two-story atrium with exposed steel structure, custom reception desk and media display. Two further examples of my work (separate projects) are shown to the left and below. Both are condominium projects with commercial space on the street level and on-site parking. Articulation, building form, scaling, materials and details for both buildings are contextual to the turn-of-the-century Victorian style of the Fairhaven, Washington, neighborhood.